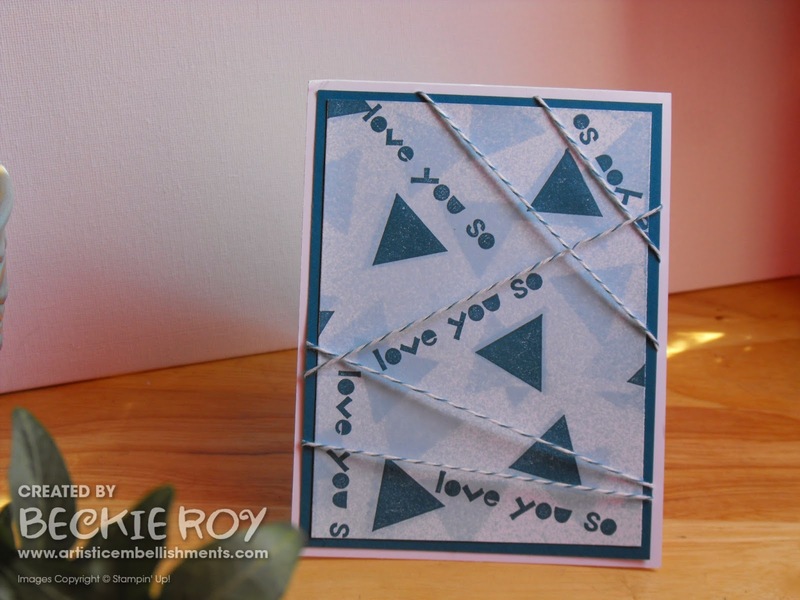 Artistic Embellishments: So in love with ... TRIANGLES! So in love with ... TRIANGLES! I have been having so much fun playing with these punches this week! I have a lot of projects to share today......... are you ready? Here we go...... there is nothing I like better than a paper punch. Today I'd like you to meet another of my true loves... the triangle punch (it's not cheating if they know about each other, right?!). I knew from the moment I saw it, that it was love at first sight... I'm a sucker for the clean lines that a punch creates. If you haven't noticed already 6 triangles creates a hexagon... coincidence?! I think not!! 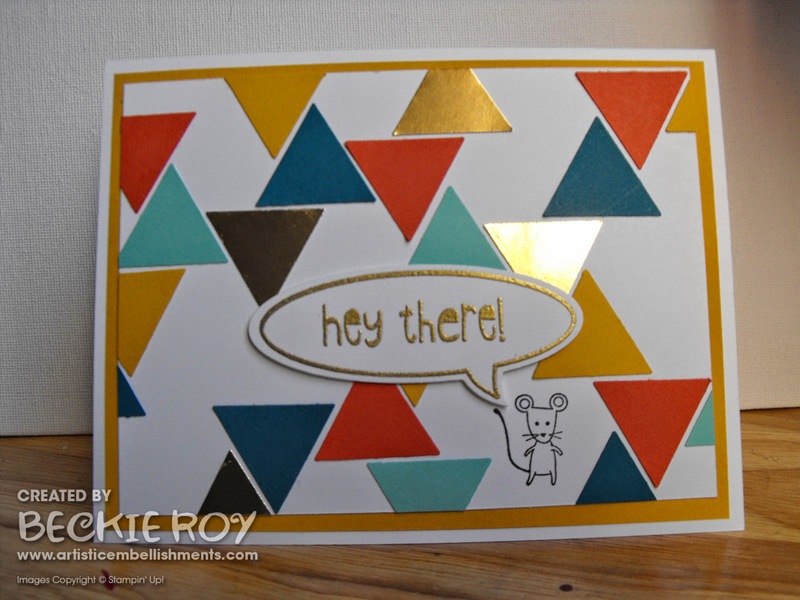 Card 1: My first triangle card today has A LOT of triangles...... I punched, and punched, and punched in three ultra-fab colours - Crushed Curry, Pumpkin Pie and Real Red = bright, happy & FABULOUS! I connected my triangles in no particular order (although, they do form hexagons?! ), just so none of the same colours were touching. I added a small pearl to the connecting points for some shine and interest. The 'hello' banners are stamped with the 'Perfect Pennants' and cut with the coordinating 'Banners' framelits. I added a small Basic Rhinestone Jewel to the center of each of the connecting triangles for a bit of shine - and seriously who doesn't love sparkle and shine?! I used a Basic Black Stampin' Write marker to colour my stamp (only the love you) part of the love you so from the Geometrical stamp set. 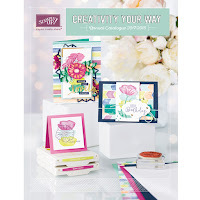 I bet you noticed that I also love that stamp set - it's no surprise since it has a bunch of triangles and hexagons in it! It's my go to stamp set for pretty much everything lately - so you'll see a lot of it on my projects. Cards 3 & 4: Here is yet another project using 'triangles'. I didn't use the 'triangle' punch in the usual way this time - in fact, there isn't a punched image on either of these cards. However, I did use the punch to create these cards.... do you know how I did it? 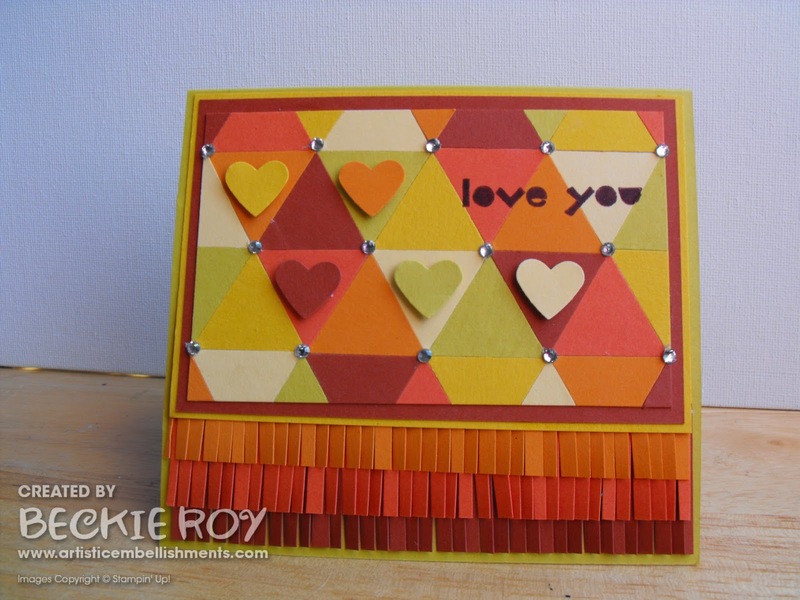 Card 5: I made this cool background using the colours from the Retro Fresh suite [So Saffron, Coastal Cabana, Tangerine Tango and Baked Brown Sugar]. 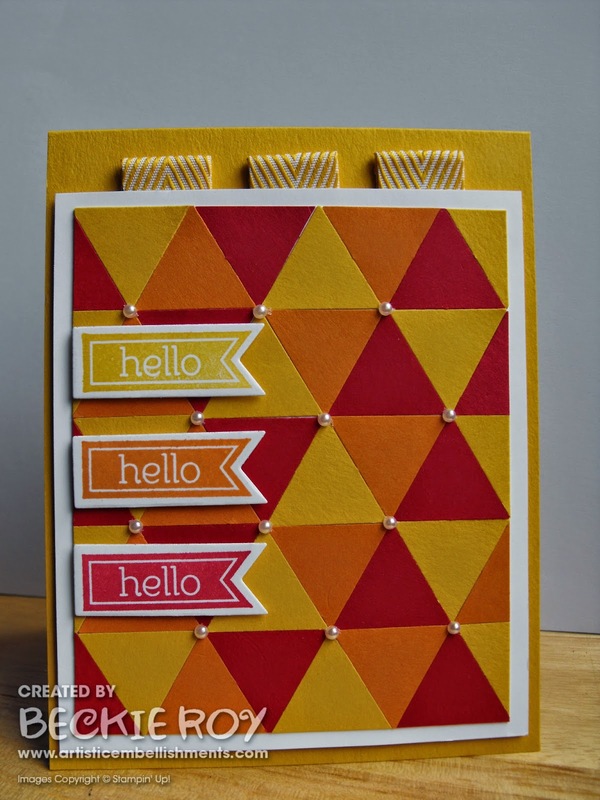 I layered the triangles side by side and then cut to have a mat of Tangerine Tango (embossed with Decorative Dots FREE during Sale-a-bration order of $60). I then started to wonder how it would look with some more black - I love the contrast that black adds to a project... so I went with it and layered strips of basic black cut 1/4" to the lines where the triangles joined together and it created a cool lattice effect. I then decided it might be nice to have some punched 'Small Hearts' to the center of each of the 'Diamonds' created by the black strips - and there you have it, my card! I am very happy with the final project - and it would be a nice masculine card too! Card 6: This is my last share today, I really love this card... I just started by randomly gluing triangles until the majority of the card was covered and here's how it turned out! I used Coastal Cabana, Island Indigo, Tangerine Tango, Crushed Curry and Gold Foil sheets - I heat embossed the 'hey there!' 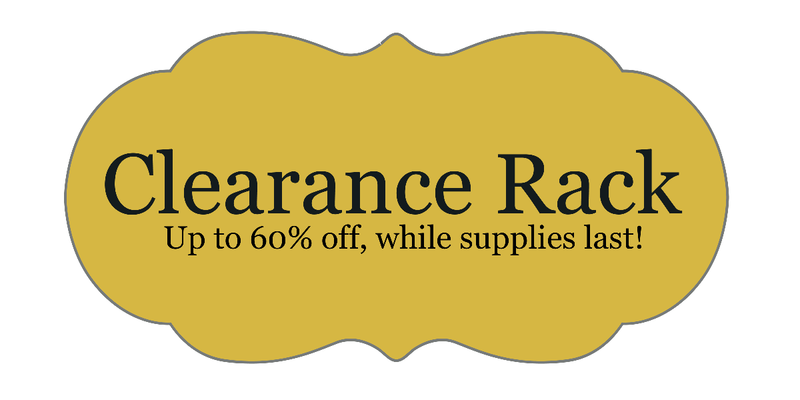 sentiment from the 'Just Sayin' stamp set with gold embossing powder and cut it out with the 'Word Bubble' framelits. I added the little mouse from the 'Life in the Forest' because he's so stinkin' cute!! 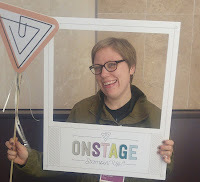 I hope you like my share and are enjoying my hexagon-triangle inspiration this week! Hooray... When HEXAGONS meet TRIANGLES!! For the LOVE of ... HEXAGONS!